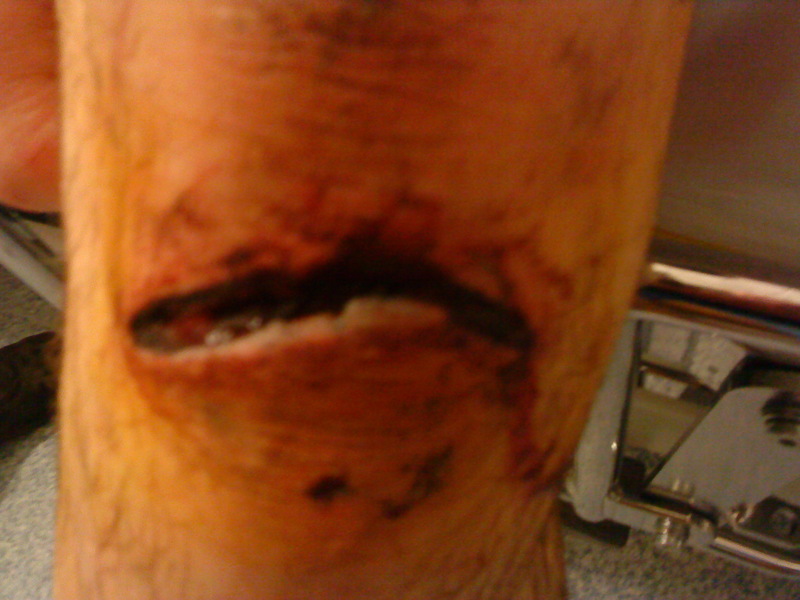 IF YOU ARE SQUEAMISH DO NOT CONTINUE AS YUCKY PHOTO AT THE BOTTOM! This week has been dominated by a sore knee, not mine but my son’s. Yes, the same son who was so poorly 15 months ago and had his large intestine removed; the same son who I have been so happy about; the same son who is back playing squash and football. It all started with a phone call from son last Sunday morning enquiring as to whether we were doing anything. I replied hesitantly, as I was about to start gardening and Hubby was busy splitting logs and we were both looking forward to a descendant free day, but I did admit that there was nothing important on the agenda. Well, it turned out that son needed us to retrieve his car for him as he was on his way to hospital for attention to a cut to his knee which he had sustained whilst playing in a football match. The other half and I drove over to the hospital to pick up the car ‘key’ (more on that in a while) and found son awaiting triage, so decided to keep him company. I couldn’t investigate the damage to his knee as he had a pressure bandage on it, so we just had to rely upon his description of a tackle which had culminated with his leg making contact with an exposed flint. When we had been there for about 20 minutes, son for about 45 minutes, he was called through. Full marks for short waiting time. After 10 minutes a nurse came into the waiting and called me, not to hold his hand, or stitch him up but so he could give me his valuables. He was going to be there for a while as they wanted to give his cut a good clean out so Hubby and I set off to retrieve son’s car, about 10 miles away. Back at chez Midwifemuse I turned on the oven, prepared the veg and then put the chicken and potatos in the oven. Less than half an hour later the phone rang, Hubby to say that son was being admitted so he was going round to DIL’s in the BMW and that I should drive over to join him as we were to look after Evie whilst DIL went to visit son. Hmmm, chicken and potatoes had been in for about 20 minutes, I would be gone for at least 2 hours, timer doesn’t work on oven since twins discovered that if you play with it it rings. Right, I just turned off oven and left everything in there to recommence roasting when we returned. Four hours later, 10pm, we returned, too late to carry on cooking so I put the chicken in the fridge. Meanwhile son had been put on IV antibiotics and scheduled for an operation first thing Monday morning. Monday morning, surgery where the gash was made slightly larger and all the mud and grass was washed out. Apparently under the skin the injury extended down far enough for the surgeon to put the fingers of one hand in the space. The tendon had been slightly injured and the bone chipped but the doc was confident there was no permanent damage especially as son was able to lift the leg off the bed but son was to stay in for another 48 hours for IV antibiotics, observation of the cellulitis which was developing and to be taught how to use crutches. Tuesday morning saw son with a markedly raised temperature and the lower part of his leg swollen, red, hot and painful. Son was still able to walk around with his crutches and was feeling positive. Wednesday and the wound was now leaking pus, son couldn’t walk around anymore, the leg was huge and the pain had increased, the IV antibiotics were changed and another wound swab was sent off. Thursday morning the docs decided they needed to have another clean-up of the wound. Unfortunately son had partaken of a cup of tea at 6am so they couldn’t operate until the afternoon. When he came back from theatre he now had a wound drain in which was draining very little, until MM decided to massage the inflamed area which encouraged lots of nice yellowy gunk to travel down the tube. Gentamicin was started, this nasty, toxic, antibiotic being the one which a nurse had given Louis too much of when he was in NICU. Friday and son was happy that the leg wasn’t as painful. He had no temperature, the wound drain was removed and, although he could no longer lift his leg, he was feeling more positive. The surgical team came around at 5pm and decided that they were happy with his progress but that they wished to keep him in until Monday. Saturday and I receive a phone call asking if I could go and pick him up as the doc had been round and told him that he was being discharged. Son was happy, I’m not. He still can’t lift his leg, still has a raised temperature and the wound is still oozing. He vacated his bed an hour before I arrived and by the time we were leaving the ward another man was in what had been son’s bed. Going back to last Sunday and the state of the pitch. On the Saturday a game had been abandoned after an inspection by the referee had declared it unfit. Prior to son’s game the players had pointed out to the ref that there were multiple large stones on the surface, however the ref declared that it was safe. As a direct result of the refs decision son has spent 6 days in hospital, had 2 operations and, if the tendon has been damaged, will never be able to play football, or any sport, again. Certainly, for son, this was a bad decision. Son’s leg injury. The cut is directly under the knee cap. A while ago a reader, Alice, asked what the -3 measurement related to when midwives* describe baby’s position and so, hopefully, I’m just about to explain the concept of assessing descent of the presenting part of baby, generally the presenting part being it’s head. Any midwives etc. reading this may well have apolexy reading my explanations which will be accuate, but not couched in medical terminology, also I have personally illustrated what I’m talking about but I am by no means an artist! There are two ways that midwives estimate how far down baby’s head has gone. The first is how it’s done in both in pregnancy and during labour and is discovered by abdominal palpation, or having a feel of the woman’s bump. When the midwife concentrates her hands just above the pubic area, and possibly asks the woman to breathe in and then relax as she exhales, the midwife is trying to determine how much of baby’s head she can feel. This may be slightly uncomfortable as the lower part of the uterus, bump, can be a bit tender toward the end of pregnancy. The midwife will then record her findings in terms of fifths. If she can still feel all of baby’s head then she will write 5/5ths palpable (palp), look at my drawings below and the 5 drawings on the left side illustrate the gradual descent into the pelvis as felt abdominally. Basically, the less of the head felt the the lower the number of fifths palpable. Sometimes a midwife will write ‘Engaged’ (eng) rather than a fraction, when this is writen it means that, in her estimation, the widest part of baby’s head has gone through the brim of the pelvis. (In the photo the brim is the top of the inner circle). Below is a photo of a female pelvis. The angle is such that if this were a real woman the photographer would be standing at the woman’s feet whilst the woman was lying on her back with her bottom tilted upwards.If you look at the inner circle of the pelvis you can see that I have stuck blue stars on little bony protruberances, these little lumps are called the ischial spines, the gap between them is about 10.5- 11 cms, and these are the landmarks that an estimation of descent, or station, of the presenting part is based upon when an internal examination is performed. S0, the spines are 0 (nought) in a midwife’s world. When a vaginal examination is performed the midwife will hope to be able to feel these small bony protruberances and then note where baby’s head is in relation to them. The spines are 0 and whether the head is above or below is expressed in centimetres, minus ( – ) if it is still above, plus ( + ) if below or, if it is level with them, then a midwife will often write ‘at spines’. My drawing shows the gradual descent through the pelvis, sort of! This is a simplistic explanation of how estimations of descent are conducted and expressed, below are a couple of on-line resources which are well worth reading. * I’ve written ‘midwife’. It could be a G.P or obstetrician. Back in July my step-father was knocked over by a car reversing off a drive, 9 days after the accident he died without ever fully regaining consciousness. The accident happened outside my Mother’s bungalow and the driver of the car lives in the house opposite Mum’s, all too close for the circumstances and the outcome to ever be away from the front of Mum’s mind for any length of time, in fact it acts as a permanent irritant. Mum has always been slightly batty but recently her mental health has been extremely volatile, manic would be a fair assessment. There has been extravagant spending, tantrums, suggestions about suicidal plans, fixating on people and then pestering them but throughout a refusal to accept help from health professionals. Her issues have placed huge strain on my sister and her family, with me caught in the wash. What has exacerbated the situation, and made it virtually impossible for any of us, but especially Mum, to start moving forward, has been the spectre of the final coroner’s inquest and all that would entail. On Friday we had the inquest. The poor man who knocked my step-father over was there by himself. Yes, he had a solicitor there representing him but other than that he was alone going through the awful ordeal of reliving the accident, minute by minute, inch by inch and having every movement he made questioned. Mum was questioned, she didn’t always answer the question directly, in fact a 10 minute ramble around the answer was her style; the police; the home office pathologist and the accident investigator were all also questioned and just under 3 hours later the death certificate was produced, accidental death. I was happy, well perhaps not happy, content, yes content is good. Mum appeared accepting of the result, we had worried that she was seeking retribution and, if not the death penalty, then that causing death by dangerous driving would be her expectation, but it seems that the inquest has been a cathartic experience. I really hope so for Mum’s, my sister’s and my own sanity, it seems there may be light at the end of the tunnel. Hubby is watching the footie, I’ve tidied up, washed up, ironed and even done some pruning and now I’m sitting itching to get back to my latest love, and the reason I haven’t been blogging, but I can’t because the footie is on. So, what is keeping me so enthralled that I’m being uncommunicative? It’s our shared christmas pressie, a wii fit plus, I love it. I know that I’m probably deluding myself but I think that I have found a perfect compromise to my enjoyment of computer games and the need to partake in exercise. I’m naturally a quite competitive individual and luckily that doesn’t have to be against others, I am quite happy just to compete against my previous achievements, the wii encourages me to do that and is telling me if I’m losing weight. Wii fit slalom – my favourite. THIS IS NOT ME!!! I wish it was, my record is 29 seconds. There you are, proud new parents of a tiny, pink little person and just as you are ready to show your beautiful creation to the world baby’s skin erupts, and or peels off. Everyone has heard of milia, or milk spots, which babies may be born with or develop soon after birth and may last several weeks. They are tiny and are generally clustered on and around baby’s nose. They are just where the tiny glands which lubricate the skin are just not flowing freely yet so tiny cysts form and as the name implies they are creamy-white. Leave them alone apart from normal, gentle cleansing with plain water. Another really common rash a baby may develop is urticaria neonatorum or erythema toxicum, parents will often see this noted by the person who examines baby and it can occur anywhere on the baby. Sounds impressive but is really nothing to worry about. It looks a bit like a heat rash, a few little red spots clustered together, and often this is what professionals will call it when reassuring Mums and Dads. Sometimes the spots do have very small yellow heads on them, they are not infected though and are totally harmless. They do disappear very quickly, only to reappear somewhere else, so often I will visit and the parents will ask me to check the spots out, only to discover that they have gone or magically moved! We have no idea why some babies get it and some don’t. I have my own theory, baby has been wallowing around in a sterile, fluid environment with nothing irritating it’s skin but once born it has different materials rubbing its skin; the skin is exposed to chemicals from washing powders and parents toiletries plus all the tiny fibres and hairs in the environment and the baby is now having to compensate for rapidly changing temperatures. Just my thoughts but worth taking in to consideration when chosing washing powders, fabric conditioners and deciding whether or not you should use that cream or those baby wipes for your little one. Anyway, it’s usually quite a short-lived rash, generally appearing within a couple of days lasting to 10 days after birth. Neonatal acne, much like the teenage version. 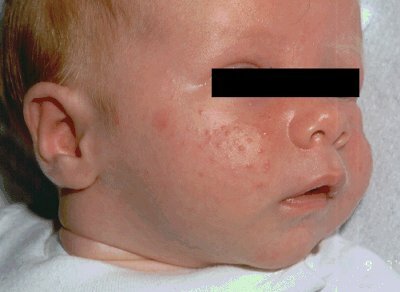 Looks horrid, lots of red pimples, sometimes all over baby’s face but most common on his/her forehead and cheeks. It usually shows up just as you are really starting to socialise, when baby is around 1 – 3 months old and it can last for weeks. It usually requires no treatment, just use clean water and no prodding or squeezing! If too much attention is paid to these angry looking eruptions then, the same as in older people, scarring may occur. On the whole the advice regarding spots is ‘ Don’t worry’ BUT if your baby has spots AND appears unwell, is overly sleepy and not feeding well please contact your G.P as s/he may have an infection. MWM, I am a bit confused by your comments. I am a 2 yr qualified GP undertaking advanced dermatology with Cardiff University. May I explore some themes with you? Firstly, I have discovered that milk spots and milia and are actually not the same thing. Milk spots are simply areas of sebaceous gland hyperplasia (or enlargement..for any other readers) which appear in the neonate (<4 week old…) and apparently generally go after a few weeks. They are white-yellow in appearance. The enlargement is thought to be related to maternal androgens transferred to babies, hence the term ‘milk spots’. They classically appear on the nose and forehead. Milia on the other hand are only white, up to 2mm in size and are due to keratin (skin’s epidermis cells) cysts (fluid sacks). Seen in up to 50% of neonates. Usually rupture within 2 months of birth. Also appear on the face/forehead. You say neonatal acne (or acne neonatorum) occurs between 1-3 months of age. Where does this info come from? Literature states it develops between the 3-6 months. I have yet to see it myself. At a glance, I am not convinced that your picture actually is acne..it looks more like sebaceous gland hyperplasia to me. Worth showing a dermatologist to confirm? So what has Marsi’s baby got? I do not diagnose over the net as a disclaimer to all readers. It maybe mildy inflammed milk spots that probably do not need much at all but a full history and examnation is required by her GP firstly. A differential could be the papules (spots) of erythema toxicum which up to 50% of babies get some form of in the first 12m. The baby should be seen by the GP to exclude septic pustulosis if mum says it is nasty. Incidentally Marsi could be worrying unnecessarily here about neonatal acne perhaps?? Unlikely at 1m old apparently. If there is one thing I have relearned about dermatology is that there is no replacement for actually seeing the lesion in the flesh. I guess we all need to carefully validate what we write for patients on the old ‘net so that we are firstly safe and secondly do not overworry mum’s. Way back in November I had the cold which was doing the rounds, that one which left people with a repetitive cough, I developed that cough. Coughs are like hiccoughs I think, they always happen at the most unfortunate, inconvenient times. My cough didn’t like me talking so the more I talked, the more I coughed. I’ve never been a person who carries a bottle of water around with me, I have no problem with tap water so I didn’t feel the necessity, the cough changed that though. My little plastic bottle was my constant companion, especially if I was doing a ‘booking’, as so much talking equals virtually continuous coughing. Embarrassing all round. 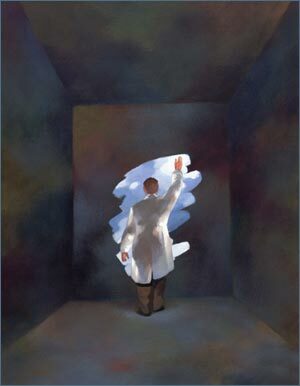 After about a month of spluttering, hugely interrupted sleep, pulled muscles and a throat that felt as if it had been sand-papered I decided to make a doctors appointment. I did a sort of bargaining with my cough, ‘ Now look cough. I’ve made a doctors appointment for a weeks time. If you are just the remnants of the cold, and should be ignored, then you have a week to stop. If you’re gone, well you don’t have to be completely gone, but if I can tell that you are sorting yourself out then I’ll cancel the appointment.’ As it was I cancelled the appointment. Not because cough was gone, no it hadn’t gone, in fact it was worse, but the Met Office was predicting serious snow and I felt that the chances of me getting to see the doc then were fairly slim. I made another appointment though, for yesterday. I was sleeping so badly and was feeling so tired and woozy that I was going to ask the doc for something to help me sleep. When I’m tired I cry easily, luckily the doctor had a box of tissues on his desk so there was no unpleasant wiping of the nose on the sleeve, there was much sniffing though. After much rambling from me the poor man elicited the information that I had a troublesome cough and a mad mother. He listened to my chest and declared that there were nasty crackles in the left lung, thank heavens for that, it’s a chest infection, I can have antibiotics and my physical ailment should be sorted, the mad mother is a different matter. We had a chat, I recounted an abridged version of the accident, step-father dying, Crown prosecution, vengeful, suicidal and shingle affected mother and it was decided that I am stressed, I prefer ‘run-down’ to describe my mood but ‘stress disorder’ is what he wrote on my sick-note. I was about to leave his room carrying prescription, and a sick note when he asked me to complete a questionnaire ‘to assess my mood’ my immediate response was ‘I’m not about to kill myself you know’. Wrong response. Apparently this means that I must have thought about it to say it. I explained that I know that G.P’s use questionnaires as alerts so I was merely trying to reassure him that I am ‘run down’ and yes, stressed, but I am not in despair. Unfortunately this elicited more sniffing from me so in the end I left his room with a prescription for citalopram as well. I’ve picked up my prescription for antibiotics, the anti-depressive can wait, I think that once my chest infection has gone and the coroners hearing is over my tearful, ‘it’s all too much’ phase will be over and I will be able to sit and chat to a sympathetic G.P without using up his box of tissues. 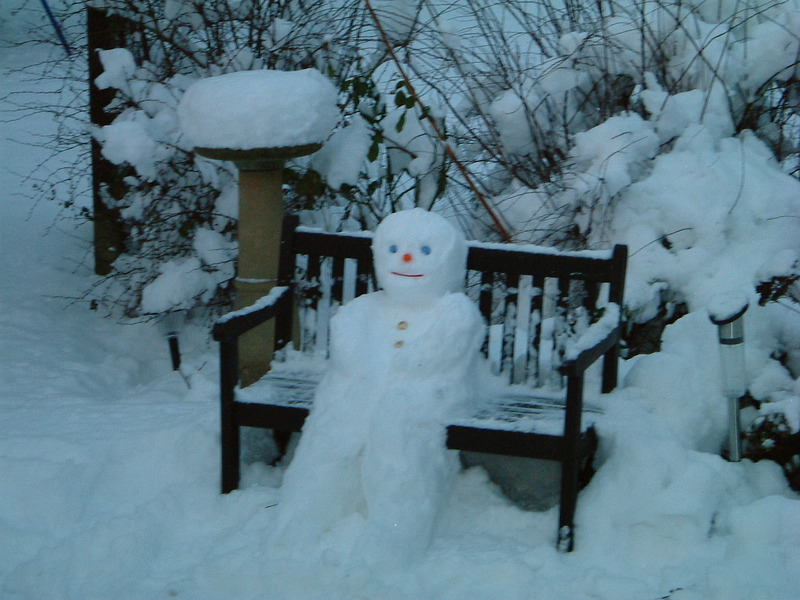 I would love to say that I built this with the grandchildren but, sad person that I am, I fashioned it entirely alone as I have 3 grandchildren who dislike the snow intensly and are quite happy to watch through the kitchen window.